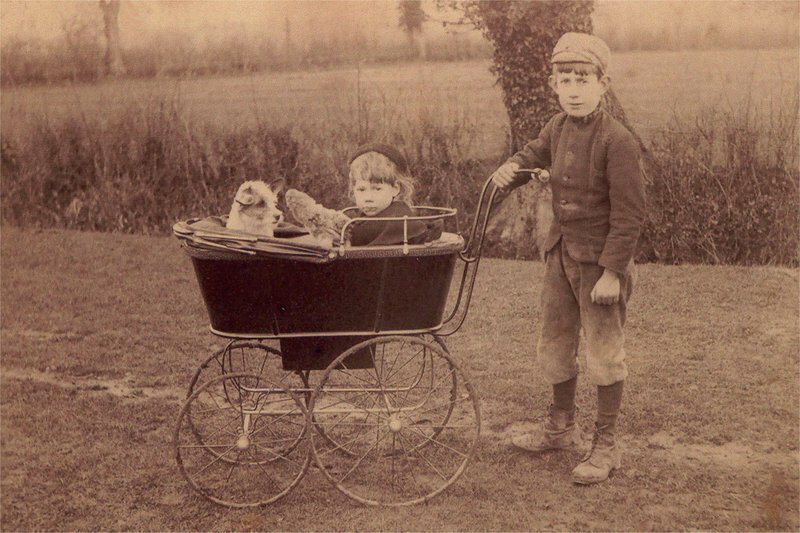 Albert Arthur Copping was born in 1894, the sixth son of Albert William Copping and his wife Annie. In 1871, the census records Albert Arthur as living in Wortham whilst Annie was a servant working for a family of farmers called Driver in her home village of Finningham. Married in 1875, the couple moved the short distance from Wortham to Roydon near Diss, here three of their sons were born: Percy Harry (about 1876), Harry William (born about 1878) and Obie Ivan (born about 1880). By the 1881 census, the family had moved to 15 Green Street in Hoxne where Albert senior was described as a builder employing three men, two of whom were quite possibly his lodgers, Edmund Lester and Harry Bartrum, both of whom came from his home village of Wortham men. A decade later Albert senior is described as a bricklayer with no employees and on the 19th May 1900 the Ipswich journal reports his bankruptcy hearing. In his financial statement Albert states that he has liabilities of £100.12s.11d, all of which is due to unsecured creditors, and assets of £13.9s.6d. His son Percy is one of the unsecured creditors as are two Hoxne men, Mr Whitton and Mr Coleman, the former the local butcher and the latter the owner of one of the shops in Cross Street. In his submission to the Court Albert stated that he had never been solvent in the 19 years he had been in Hoxne, however the Official Receiver was clearly unhappy with Albert's financial statement and with the answers given at his hearing and he was told to go away and “furnish an account showing what money he had in his possession on September 29th last”. In the 1901 census Albert senior's listing is still listed as a bricklayer with no employees. Despite Albert Williams financial woes during his life in Hoxne his family continued to grow with the birth of Wallace Arthur (born about 1886), Victor George (born about 1889), Albert Arthur (born about 1894) and Annie (born about 1896). Arthur senior died in the quarter ending 30 June 1904, his wife Annie survived him and in 1911 was still living in Hoxne in a house in Low Street. "SLHG, “Annie Copping and Albert Copping,” Stradbroke Village Archive, accessed December 16, 2014, http://www.stradbrokearchive.org.uk/items/show/12." With over a twenty year gap between oldest and youngest sibling it is not surprising that some of the family started to move away. Obie was the first to leave, we do not have the exact date of his departure but his destination was London for in 1899 he married Ada Florence Hartwell at West Ham. Both the 1901 and 1911 censuses record Obie as a carpenter/builder and by 1911 he and Ada had started a family. Obie also started the Copping family's departure from Hoxne to the potentially greener grass of urban London. Percy married Emma Eliza Tye in 1897 and remained in Hoxne. The 1901 census appears to record him as an employer with two young children, a third child Lawton Ebie, was born in 1903. By 1911 the family had followed Obie and had moved to East Ham in Essex where Percy's occupation was noted as a builder and decorator. In 1901 Harry was still living with his parents in Hoxne and was a bricklayer. At some point after the census he joined his two brothers in London for in 1906 he married Ellen Talbot. Harry remained a bricklayer. There is some confusion regarding to Wallace Arthur, as his is recorded on the 1891 and 1901 censuses for he appears to have changed his name to William Harry and it is as William Harry he married Daisy Alithia Earee in late 1908. If Wallace Arthur is indeed Willaim Harry, then the 1911 census also records him living in Sudbury as a County Court Baliff, so with a name change came a change in the traditional Copping occupation as builders/bricklayers. Victor George is an enigma, he is twelve on the 1901 census and living with his parents but no record of him exists in the 1911 census and there is no evidence that he served during World War 1. The only tenuous link to Victor is that a Victor George Copping did marry an Edith M Swann in Islington in 1915 but there is no evidence that he came from Hoxne. Arthur William and Annies only daughter, another Annie, was only five at the time of the 1901 census by 1911 she is recorded as a nurse/domestic maid working for George Salter, who owned a grocery and drapery store in Stradbroke. In 1917 she married Fred Thirkettle in Woodbridge. Albert would have been eleven when his father died and it is probable that either Percy, Harry or Obie took responsibility for him for on 16 March 1908 he enlisted in the elite Grenadier Guards on a Long Service contract (twelve years with the colours) he was, according to his attestation papers 14 years 4 months old. His occupation as a warehouse boy indicates that he had been living in London prior to his enlistment, indeed he could have been living there since leaving school, presumably at the age of twelve. His next of kin are also noted, Mrs A M Copping of Hoxne, Eye, Suffolk and his brothers Percy, Harry, Wallace, Obie and Victor and his sister Annie. On enlistment his medical examination showed the physically Albert stood at 4 foot 11 inches, he weighed 90 lbs had a chest measurement of 31 inches with a range of expansion of a further two inches. His complexion was medium, his eyes and hair brown and he had a pulse rate of 84. Distinctive marks were moles on the top right shoulder and navel. His medical examination was signed off on the 1 March 1908 and countersigned by the acting attesting office, Major G Montgomerie, himself destined to die with the 3rd Grenadiers in October 1915. Albert had enlisted in one of the premier Infantry Regiments in the British Army. Originally formed by King Charles II in 1656 as his “Royal Regiment of Guards” at Bruges the Grenadiers were considered the senior Regiment of Foot Guards and since their formation had fought in virtually every campaign undertaken by the British Army up to 1914. As J M Craster notes the Grenadiers “did not have a monopoly of discipline, smartness or professionalism” amongst the units forming the British Expeditionary Force (B.E.F.) but the Regiment did produce officers and men who believed they did uphold the highest standards in all three. In return for their total commitment men who enlisted in the Grenadiers could expect to become heirs to a tradition of welfare and care that was not always present in the many regiments of the Army, in addition Guards Officers were expected to think of the welfare of their own men before themselves as a matter of course. 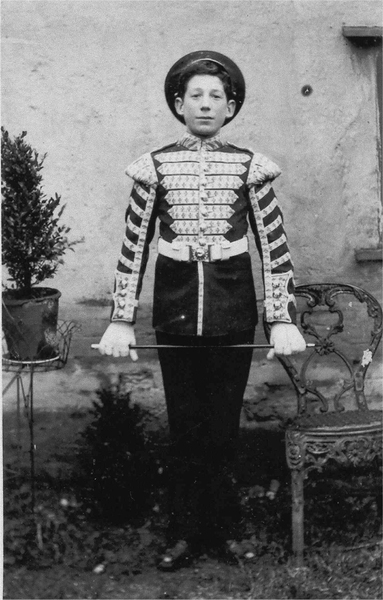 "SLHG, “Drummer Albert Copping as a boy soldier in The Grenadier Guards,” Stradbroke Village Archive, accessed March 19, 2015, http://www.stradbrokearchive.org.uk/items/show/671." As a boy soldier, Albert's education was quickly taken in hand on the 25 September 1908 he obtained a third class certification of education and then on the 26 February 1909 a second class certificate. On the 28 April 1909 he was appointed a drummer, a post that included playing the fife and quite possibly the bugle and one which was very important. The use of the drum as a means of communicating orders, to signal commands or to beat the charge were probably anachronistic in the British Army of 1914. However, other than the ever important ceremonial role played by the various Guards Regiments, the side drum was still had an active role of controlling the movement of troops whilst on the march: Ordinary time being 72-75 paces per minute, Quick time 100 paces a minute and Double Quick time 120 paces a minute. Albert Copping. Drummer in the Grenadier Guards. "SLHG, “Albert Copping. Drummer in the Grenadier Guards - Killed in Action WW1,” Stradbroke Village Archive, accessed March 19, 2015, http://www.stradbrokearchive.org.uk/items/show/419." The census of 1911 included the military as it did everyone else and Albert is placed in the Mcgrigor Barracks, Stanhope Lines, Aldershot. This barrack was one of a large number of purpose built barracks that emerged following the Barrack Act 1890 and formed part of the major redevelopment of the camps at Aldershot. Brick built and standing two storeys high they may have looked very institutional but were a vast improvement on the wooden huts they replaced. The hundred men who shared the barracks came from a wide variety of regiments and branches of the army. There were many from the Royal Army Medical Corps who served in the nearby Cambridge Military Hospital plus a large contingent from the Dragoon Guards and county regiments like the Suffolk's and Hampshire's. 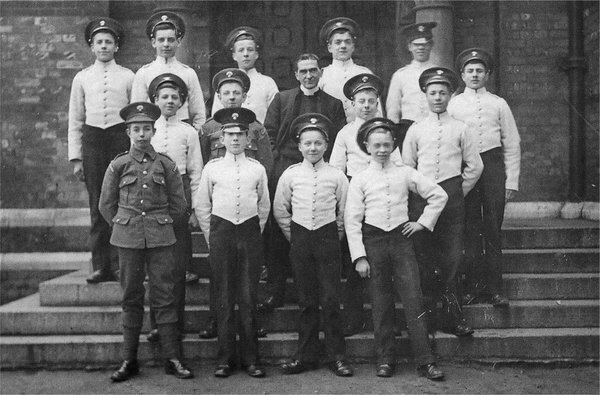 Arthur, one of the youngest listed, was the only Grenadier and unfortunately we have no idea why he was sent to Aldershot, it is unlikely that it was related to his position as a drummer as Army musicians had been trained at Kneller Hall near Twickenham since 1855. Albert's Army career continued, he was not promoted but being stationed in the capital and a member of one of the Empire's premier infantry regiments he was, presumably, quite content with his lot. However, things were about to change. With the invasion of Belgium on the 4th August 1914 the British Governments perceived that it had little option but to declare war on Germany, and having already instituted what was termed the precautionary phase in late July the Declaration of War on the 4th August found the British Army already on a war footing. Albert and his comrades in the 2/ Battalion Grenadiers, together with the men of the 2nd and 3rd Battalion Coldstream Guards and the 1/Irish Guards, formed the 4th (Guards) Brigade of the 2nd Division of the I Corps of the B.E.F commanded by Sir Douglas Haig. On the 12th August the battalion, under the eyes of Queen Alexandra, left the their Chelsea Barracks and marched the 3 miles to Nine Elms railway station where they were taken by troop train to Southampton Docks and embarked, together with their horse, carts and wagons, on the Union Castle Mail Steamship the S.S. Cawder Castle. After a brief and uneventful voyage they arrived in Le Havre on the 13th where they were received with great enthusiasm by the French civilians, Major Gordon-Lennox recording in his diary that the battalion was cheered “to the echo” with the British troops responding by singing the Marseillaise. In blazing sun the battalion disembarked and began the five mile march to the rest camp, it turned out to be a somewhat tumultuous march with jubilant French townsfolk cheering them on there way but, as Gordon-Lennox reports, soon “with the sun on our backs and no air, everyone felt the heat very much, and the men started falling out, a few at first and then more”. The problems were exacerbated by the locals pressing the troops with a rough local cider so that march discipline all but collapsed and “men fell out by tens at a time”. Many just collapsed onto the road, these were pulled to the side of the road where they were collected up by the battalion transport or tended to by local inhabitants. We will never know whether Albert succumbed to the temptation of cider but being a drummer he was probably too close to his company commander to take to much advantage of French largesse. Needless to say Gordon-Lennox was horrified with the lapse in the Grenadiers famed discipline. The 14th was spent at the rest camp recovering from the exertions of the previous day but in the early hours of the 15th the battalion entrained at the local station and travelled via Rouen, Amiens, Arras, Cambrai and Busigny to Vaux, and as during the march from Le Havre they were met at each station by jubilant crowds cheering them on. The weather however had taken a turn for the worse and battalion detrained in a torrential rainstorm which persisted as billets were organised. On the 16th the battalion marched onto Grougis where they stopped for four days whilst the B.E.F. finalised its concentration before advancing. This period gave the battalion an opportunity to harden up the reservists who, too used to civilian life, were finding active service very strenuous but it also gave the battalion the opportunity for relaxation and to help the locals with their harvest. For men like Albert, with their roots in the countryside, this brief interlude of normality must have been pleasant. This rest period also saw the battalion inoculated against typhoid which resulted in many men feeling distinctly underpar when the march was resumed on the 20th. At the General Headquarters Sir George French and his staff were trying to get to grips with the stresses and strains of continental warfare in addition to trying to support the French High Command in the last of their frontier offensives. The B.E.F. 's orders were to march northwards so that by the 23rd August they would be in Belgium holding a line between the village of Lens and the small town of Binche supporting the left flank of the French Fifth Army commanded by General Charles Lanrezac which was also advancing northwards. So on the 21st August fifty six battalions of the B.E.F. moved northwards, the route of the 3rd and 5th divisions of II Corps taking them to the west of the fortress town of Maubeuge whilst the 1st and 2nd divisions of I Corps, including the 2nd Grenadiers and Albert went to the east of the town. During the early hours of the 23rd the division crossed the battlefield of Malpaquet, the scene of Malborough's bloody victory over the French in 1709, and were approaching the southern outskirts of Mons. For Albert however the crossing of the Franco/Belgique border had unforeseen consequences for as Gordon-Lennox recorded “The drums are not allowed to play, which is rather ridiculous as they are a tremendous help on the march”. Unfortunately senior officers considered that the noise of the drums would attract the attention of the enemy and give the columns position away, in one fell swoop Albert and his fellow drummers were relegated to position of orderlies and their drums put on the battalion transport. After a lengthy halt the battalion moved towards the sound of the now very audible German artillery and took up position in support of the 2nd Royal Irish Rifles on a prominent hill near beyond the small village of Harveng. Sited on the reverse slope of the hill the battalion came under fire from German artillery but fortunately the normally lethal shrapnel balls went into the valley behind the shallow scrapes the Grenadiers had dug for themselves and as the darkness fell the men tried to rest and get some sleep. In the early hours of Monday 24th the Commanding Officers (C.O. 's) of both the Grenadiers and Irish Rifles realised that their position was too exposed and both agreed to withdraw back towards Harveng , the Grenadiers situated on the reverse slope were the first away but were met by an orderly with orders from Brigade Headquarters not to withdraw so they started to retrace their steps back to the hill. The march was did not last very long as they met the Irish Rifles coming down and after a brief discussion both C.O. 's resolved to continue to withdraw and the last they saw of the hill was its summit wreathed in air burst from German shrapnel shells. By mid afternoon the battalion was resting in fields around the village of Quevy but under the probing fire of German artillery luckily they did not suffer any casualties and were soon ordered to withdraw back to the village of Malgarni where they bivouacked in the open fields. Lieutenant-Colonel N.A.L. 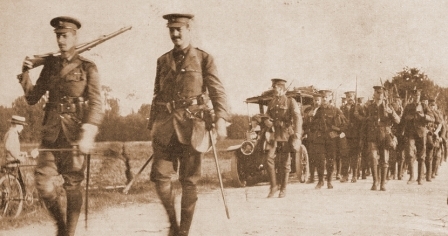 Corry leads the 2nd Battalion out of Le Havre, August 1914. Courtesy of the Great War Primary Documents Archive, www.gwpda.org. Although Albert and his comrades were aware that they were moving away from the Germans rather than towards them they probably did not realise that they were in the first stage of what was to become known as the Retreat from Mons, a very long and extremely tiring and trying march of some 200 miles that took them all the way back to the outskirts of Paris. I Corps had played no active role in the Battle of Mons of the 23rd August where the II Corps suffered some 1,600 casualties or the stand at Le Cateau on the 26th which, some historians argue, saved the B.E.F. from annihilation. However for Albert and the men of the 2nd Grenadiers it would not be long before they were coming to grips with the Germans, on Tuesday 25th after a gruelling fifteen mile march on roads congested by I Corps infantry, transport and increasing numbers of terrified refugees attempting to flee the advancing Germans, they arrived in the largish town of Landrecies on the river Sambre and caught up with Sir Douglas Haig and I Corps Headquarters which was based there. Shortly after arriving in the town the alarm was sounded when a group of German cavalry rode into the Landrecies expecting it to be unoccupied, they hastily withdrew but as a result it was decided it might be a good idea to move troops across the Sambre to the northern and westerns sides of the town and establish a line of outposts to counter any further German advance. It fell to the 3/Battalion Coldstream Guards to man these outposts in the suburbs several hundred yards beyond the Sambre. It was a fortuitous move as the Germans, masquerading as French troops, attempted a coup de main to take the town. They were unlucky as a Coldsteam officer on the spot ordered his men to open fire and soon fighting was at very close range. The Grenadiers were quickly sent to the Coldstreams aid, Numbers 2 and No 3 Company taking up position around the railway station, Number 1 Company holding some of the side roads leading back to the bridge across the Sambre and No 4 Company held the bridge itself. The Grenadiers also sent their machine gun to cover the Coldstreams whilst the defences were supported by a gun from the Royal Field Artillery positioned near the railway station. We have no idea where Albert was in this confusing melee but as an orderly he may have been used as a runner taking messages between the battalion's positions. By the early evening combat was well and truly joined, the German supported by their their artillery attempted repeatedly to attack directly down the main street but each assault stalled with heavy losses. Sometime around 11pm the Germans tried to outflank the positions by crossing the railway, the Grenadiers prevented this with accurate rifle and whilst there were no more attacks desultory firing continued into the early hours so no one got much rest. At 3 am the Irish Guards moved through the Grenadiers position to prepare a counter attack, it did not materialise and within the hour both the Irish Guards and Coldsteams, the latter having suffered some 120 casualties during the action, fell back through the Grenadiers and crossed the Sambre. The Grenadiers then started their own withdraw hugging the walls of house of the very straight main street in the hope that they would remain undetected as it was now getting light, luck however was with and much to their own surprise they crossed the Sambre unmolested but without much of their kit as the carts on which it was stored had been used to build barricades. In terms of casualties they were also lucky, in comparison to the Coldstreams, losing one officer killed and six other ranks wounded in their baptism of fire. Once through the town they passed through the Coldstreams and Irish Guards who had taken up defensive position on high ground to the south east of the Landrecies and were acting as the rear guard. Despite overwhelming tiredness due to almost constant action, the battalion marched the eight miles to a point a little to the north of the village of Oisy here they bivouacked and dug defensive positions astride the Landrecies road. An early start on the morning of the 27th August saw the withdrawl continuing, at Etreux, where they had been feted on their advance towards Mons, their reception was lukewarm from those civilians who still remained in their homes. No one, senior officers included, actually knew where the Germans were so Brigade continued to march towards St Quentin where they dug in on high ground as a German attack was expected at any time. Unknown to Arthur and his comrades the German advance had been delayed by the actions of the 2nd Royal Munsters who, as part of the 1st Guards Brigade, formed the I Corps rearguard at Etreux. Having repulsed initial German attacks, which allowed the I Corps to continue its retreat, the Munster should have been withdrawn, unfortunately the orders to do so failed to get to through and the Battalion was quickly surrounded. It took the Germans close to twelve hours to annihilate the Munsters but by this time I Corps was clear of the area and able to continue its withdrawal unhindered. The 28th August saw the march commence at 3am, moving cross country the Grenadiers crossed the meandering river Oise at Devillet a small village near La Fere and bivouacked for the night after a hard 19 mile march made worse by the heat of the day. The next day saw the Grenadiers entrenching their position to fend off a rumoured German attack, it also saw Sir John French issue an extraordinary message expressing his thanks to the officers and men of the B.E.F. for their efforts and informing them that it was his intention to shortly disengage from the campaign in order for the Army to rest and refit. This message sent a shock wave through the corridors of the French High Command who were trying to contain the German right wing whilst assembling a new army to counterattack the German advance it also reverberated as far as Whitehall and resulted in a flurry of cables between Lord Kitchener, the Secretary of State for War and Sir John. Not satisfied with the responses he received Kitchener would take the boat train from Charring Cross on the 31st August to meet Sir John face to face. In, what has been described as a highly charged meeting in British Embassy in Paris on the 1st September, Sir John argued that the B.E.F was on its last legs and needed to withdraw to re-equip before re-entering the war Kitchener was having none of it and managed to calm Sir John's nerves. Events in the field were, however, overtaking any considerations of withdrawal. After a rest day the battalion moved off at dawn on the 30th, the pre dawn coolness was soon transformed as the sun rose. In stifling heat the Grenadiers marched about 23 miles to a bivouac just west of the village of Pasly and over looking the town of Soissons and the River Aisne. The 31st saw them across the Aisne and after a march of some 11 miles, again in oppressive heat exacerbated by the dust kicked up from the numerous columns, they reached high ground above the village of Soucy and bivouacked amongst the wooded slopes. The next day brought the war much nearer as the sound of artillery and small arms could clearly be heard as the B.E.F. rearguard closed up on the 2nd Division with the Germans on their heels. For Gordon-Lennox this meant little more than “we shall be shortly inundated with orders to march, to be followed shortly with counter orders”, cynicism had clearly taken hold. If Landrecies had been the Grenadiers baptism of fire it had been, in reality, little more that a skirmish, all that was about to change. Around midnight on the 31st August the 4th Brigade was ordered, with support from the Royal field Artillery and the Divisional Cavalry, to form part of I Corps rearguard. When the orders reached the Grenadiers 'Ma' Jeffrey had to set them in motion as he the only response he got from the C.O., after vigorously shaking him awake, was “you deal with them”. Breakfast was eaten at just after Reveille at 3.00 am and within the hour Albert and his comrades together with the men of the 3/Coldstream Guards were digging in between the villages of Montgobert and Soucy, just a little north of the village of Vivieres. A little before dawn with thick mist shrouding the countryside the main body of the 5th and 6th Brigades of the Second Division withdrew through the rearguard and into to the Retz Forest (Foret Dominiale Retz) behind Vivieres, by 6.00 am the mist had started to lift but the improvement in visibility brought the German cavalry scouts and although driven off by rifle fire they were soon reinforced by elements of the German 5th and 6th Divisions part of General Lochow's III Corps. The day was to follow, initially at least, the pattern of the last week. Let the Germans make contact, force them to deploy and then delay them for as long as possible without risking the rearguard being overwhelmed, once the threat became too great then withdraw through the troops manning the next rearguard position and dig in at what was to become another stop line. With the exception of the loss of the Munster's and some close calls it was a system that seemed to work. The B.E.F. may have been tired but so were the Germans trying to catch them up and, in addition, they had the problem of logistics: the further they advanced into France and away from their supply dumps the more difficult it became not merely in terms of provisions but also ammunition and replacements for both men and horses which had been lost. Under spasmodic artillery fire the 2nd Grenadiers and 3rd Coldstreams withdrew, without suffering casualties, into the Retz Forest passing the next stop line manned by their fellow Guards, the 1/Irish and 2/Colstreams, on the northern edge of the Forest. In 1914 the area covered by the Forest de Retz was considerable, even today it covers nearly 14,000 hectares and has 560 Kilometres of footpaths, and virtually surrounds the small town of Villers Cotterets which acts as a small transport hub with roads running from the town through the forest to Vivieres, Puisiux and, most importantly, to the major centre of Soissons. Once off the roads the Forest was a criss- crossed by a network of rides, the largest running east to west and crossing “Le Rond de la Reine”, a clearing on the road to Puisiux, but numerous others did not really follow any pattern at all. Once off the roads or the rides the Forest was dense, inhibiting movement and creating a very confused environment in which to fight a battle. Withdrawing down the Puisiux road the Grenadiers and 3rd Coldstream took up defensive positions at “Le Ronde” astride the main east west ride, here they established their positions, 1st and 2nd Companies of the Grenadiers on rising ground a little south of the east/west main ride and the 4th Company along the ride to the west of “Le Ronde” with the 3/Coldstreams to their left. No 3 Company appears to have held in reserve. We do not know in which company Albert was serving but, assuming he still had a role as a runner/orderly , he would have been in close company with an officer so that orders could be processed and information passed back to Battalion H.Q. Patrols were sent out to the check the rides to the north and make sure the Germans were not infiltrating around second stop line on the forest edge. Much to the astonishment of “Ma” Jeffrey the next arrival was not the German's army but an order from Brigade Headquarters that they were to hold the position until 1.00 pm “in order to enable the rest of the Divisions to halt and have dinners” followed by some sections of British Cavalry who came down the main ride from the east after hearing the initial gunfire and deciding to investigate. After exchanging information, or rather the lack of it, for neither groups had been told of the position of the other the cavalry moved off towards the left of the Grenadiers and Coldstream's line. Not long after this heavy gunfire was heard from the direction of the northern edge of the forest where 2/Coldstreams and 1/Irish held the second stop line and having stopped the German advance the two battalions prepared to withdraw behind the “La Ronde” line. The 2nd Coldstream's and the supporting artillery withdrew down one of the north-south rides to the railway line north of Villers Cotterets, as the Irish Guards were preparing to disengage and retire they received the same orders that had so amazed Jeffrey and were forced to hold in their current position. Aubrey Hubert, an officer with the Irish Guards, was of the opinion that if the division took too long over their lunches the battalion would probably be wiped out. Assaulted from all sides and massively outnumbered Lieutenant-Colonel Morris, the Irish C.O. had no alternative but to order a withdrawal and with the Germans almost on top of them the Irish Guards fought a running battle back to the “La Ronde” line. Aubrey Herbert remarked “there was a tremendous fire. The leaves, branches etc rained upon one. One's face was constantly fanned by the wind from their bullets”. Lieutenant Colonel the Hon George Morris together with the battalions second in command were both killed during the withdrawl. Although the terrain made it difficult for the Germans to take advantage of their numerical superiority they soon began to infiltrate the “Ronde de la Reine” line and were quick to exploit the gaps that existed to the left of the Coldstream's positions, in the very dense woodland the combat was confused and disorientating, sometimes both forces clashed in hand to hand fighting and at no time were the two forces more than 100 yards apart. In an effort to blunt the German advance elements of the Grenadiers 4th Company mounted a limited counter attack, it did ease the pressure on the line but they suffered heavy losses in the process. At Brigade level the losses amongst senior officers continued to rise, Brigadier General Scott-Kerr was seriously wounded and was taken to the rear by the Brigade Major so command of the Brigade devolved on Lieutenant-Colonel Corry of the 2nd Grenadiers with “Ma” Jeffrey taking over command of the battalion. With consummate professionalism the 2/Grenadiers gave covering fire whilst the 3/Coldstream and 1/Irish fell back diagonally behind them and withdrew to the railway line north of Villers-Cotterets. Under Jeffrey's command the 2/Grenadiers also slowly withdrew and managed to extricate themselves from both the Germans and the Forest and withdrew through a very empty Villers-Cotterets and passed through the 6th Brigade's positions just south of the town. For the 2/Grenadiers the action in the Retz Forest was a bloody initiation, the War Diary records in stark detail “Lost, 4 officers ...with losses amongst non commissioned officers (N.C.O. 's) and men as follows:- 2 wounded, 122 missing”. Many of these losses must have occurred amongst the men of the 4th Company which suffered losses not only during their counter attack but also when the order to withdraw failed to reach them. As the depleted, and no doubt shocked, Battalion marched south they could hear artillery fire from Villers-Cotterets as the 6 Brigade engaged the German advance guard emerging from the Retz Forest and it did not take long before they were ordered to retrace their steps and fortify the small village of Bousonne so that they could cover the withdrawl of the 6th Brigade who, in Jeffrey's words “gradually dribbled through us”. Fortunately the confused action in the Retz Forest had resulted in the Germans being unable to continue their advance so by early evening the exhausted men of the 2/Grenadiers were allowed to disengage and withdraw and after two hours of negotiating cross country tracks they emerged at Divisional H.Q. at Thury . Here they found that their Brigade HQ, together with their supplies and transport, was four miles to the west at Betz but to Albert and his comrades, dead on their feet and extremely hungry, this might as well have been forty miles. Jeffrey's, after an acrimonious attempt to secure rations from bureaucratic and pompous Assistant Quarter-Master General named Conway-Gordon, went to see the Divisional Commander who promptly sided with Jeffrey's. One miles march brought the Battalion to a ration dump where they drew tins of bully beef, jam and crates of biscuits and after eating Albert and his comrades, exhausted but no longer hungry, lay down by the side of the road and slept. By the early hours of 2 September the Battalion was again on the march and by 4am were at Betz where they were reunited not only with the Brigade but also picked up some men who had been separated from the Battalion during the withdrawal from the forest. Breakfast was eaten at Puisieux at 9.30 am and as the sun brought in another scorchingly hot day the retreat continued. At 4.30 in the afternoon the battalion was bivouacked near Rolentier after a march of 22 miles. The next two days followed the same pattern and although the German pursuit was close the Grenadiers were not engaged. On the 4th September some welcome reinforcements arrived in the shape of some 90 N.C.O. 's and men under the command of Captain “Teddy” Ridley. On the afternoon of 5th the Battalion reached Fontenay where they had the opportunity to rest and clean themselves up after the hot and dusty march, it was here that they heard rumours that the retreat was at an end and that the B.E.F. was to about turn and advance. For once the rumours were true. The French Commander in Chief, General Joseph Joffe, had been planning a counter attack for some days and now his plans were, thanks to a degree of confusion and disagreement in the German camp, coming to fruition. On the 5th September the Battle of the Marne commenced and brought to an end Germans plans for a swift victory, the timetable on which German war aims so heavily depended had been derailed. On 6th September Jeffery recorded “Marched off 5.30a.m. advancing....After three comparatively easy days and three nights of sleep the men are fit and hard”. With the newly arrived III Corps on their left and the I Corps on their right the Grenadiers and the rest of the II Corps advanced. In a reversal of roles it was now the Germans intention to delay the Allies advance and indeed the B.E.F. did move forward slowly in part due the German actions but also due to the cautious attitude of B.E.F. senior command. This hesitancy came from the top, Sir John French fearful of having his flanks turned and wary of his French Allies, did not allow the advance to be transformed into an attack. This caution permeated down from Sir John through his Staff officers and into senior ranks at Divisional level, at Regimental level both officers and men were irked by the air of hesitancy surrounding the advance. If this was not enough, the weather turned and it started to rain heavily. The final eight days of Albert's life was concentrated on crossing rivers. By the afternoon of Monday 7th September the battalion was standing on the southern bank of the Grand Morin watching columns of Germans withdrawing towards the north. After a 13 mile march in steady rain the Grenadiers reached Voigny and were bivouacked in the Church. By 5.30am the next day they were on the march again and, after the inevitable confusion that dogged the B.E.F. at this period, they reached the Petit Morin. Here the German rearguard decided to stand and under artillery and machine gun fire, the Grenadiers were sent in support of the 3rd Coldstream which was attempting to cross the Petit Moran and come to grips with the German rearguard dug in on high ground above the river. With some artillery support from a battery of howitzers and in some confusion individual groups of the Grenadiers, Coldstreams and Irish Guards reached the bridge at the hamlet of St Gravier and managed to cross the river. The Germans withdrew leaving some dead and an abandoned artillery battery plus a hundred or so prisoners from a machine gun company which had been surrounded by the Coldstreams. There had however been casualties, a number of Coldstreamer's were wounded by friendly fire and the Grenadiers had one officer, Captain “Tich” Stephen and 18 other ranks wounded, Captain Stephen would die of his wounds on the 9th September. In the pouring rain the advance continued and the Grenadiers now began to feel the loss of coats and waterproofs left in their transport at Landrecies. After the crossing of the Petit Morin the 4th (Guards) Brigade were placed in reserve and the next few days were taken up with trailing in the wake of the advance guard who were pursuing the Germans, although in reality pursuit was too strong a word. Although there were occasional bursts of sun in the main the weather was miserable, pouring rain which soaked officers and men alike,. The villages and towns that they now passed through showed considerable evidence of looting and wanton destruction along with piles of empty bottles of alcohol. At Charley, according to rumours going rounds, the Germans were so drunk that they did not demolish the bridge which allowed the British across the Marne without any problems. On Saturday 12th September the Grenadiers crossed the River Vesle at Braine in the pouring rain and by the morning of the 13th they were established on the high ground south of the village of St Mard beyond which was the River Aisne. Beyond the Aisne the countryside that now lay before them consisted of a long west to east limestone plateau along which ran the road named after the two daughters of Louis XV, the Chemin de Dames. The topography of the area, numerous high sided valleys covered in woods, favoured the defence rather than attack. With the Brigade taking its place at advance guard it fell to the 2/Coldstrreams supported by Artillery and the Grenadiers machine gun section to cross the canal that ran close to the Aisne and then across the partially demolshed bridge at Chavonne to secure the northern bank whilst the Grenadiers, using the cover of woods that ran down to the river effected a crossing using boats at a point opposite St Mard. Other than the light shelling it was clear the Germans had withdrawn from the immediate area but before either the Coldstreams or Grenadiers could move forward they were ordered, for no appreciable reason, to withdraw back across the canal and river, although the bridge at Chavonne was secured. At 8.30am on the 14 September Albert and the 2/ Grenadiers, acting as the advance guard, crossed the pontoon bridge hastily thrown over the Aisne at Pont Arcy, it was misty and a light drizzle was falling. Advancing up rising ground they secured the village of Soupir then moved into the wooded slopes of the valley as far the Cour de Soupir Farm where they found the 2/Connaught Rangers already in possession. The Germans quickly counter attacked and a confused action ensued at close quarters involving all the 4th Brigade's troops. By lunchtime the position had stabilised but the defences soon came under a sustained artillery bombardment although this did not prevent the British making a further attack towards the ridgeline behind the Farm, which manage to clear a wood the Germans had been using as cover. When darkness fell stretcher bearers from both sides were sent out to retrieve the wounded who were scattered throughout the battlefield, the British resumed the search at first light and, as recorded by Jeffrey, managed to “get in a few more wounded-all in a pitiable state-” but continued shelling of the area prevented all the wounded being collected. The medical facilities, now based at the Farm, were swamped with wounded men and it took two days to get all the casualties away and out of harms way. For the Grenadiers fate had one last throw, the shelling of the Farm had become very intense so the defenders, including men from the 2/Oxfordshire and Buckinghamshire Light Infantry who had come up to support the Grenadiers, withdrew to the shelter of a small quarry nearby. The protection offered by the quarry was illusory, after an hour of intense bombardment a howitzer shell plummeted into bottom of the quarry killing or wounding some 40 Grenadiers and 50 Oxfordshire and Buckinghamshire's together with 10 men from the Royal Army Medical Corps who had set up a casualty clearing station there. The Grenadiers losses during this action were two officers killed and six wounded, N.C.O. 's and men suffered 17 killed , 67 wounded and 77 missing. Albert was amongst the missing. We do not know whether Albert died in the quarry or in the action in the dense woodland surrounding the Cour de Soupir Farm as he has no known grave. He is commemorated on the Hoxne War Memorial and the La Ferte-Sous-Jourre Memorial to the Missing which records the names of 3,740 officers and men of the B.E.F. who fell in action at Mons, Le Cateau, the Marne and the Aisne between August and early October 1914 and have no known grave. Albert was one of thirteen Grenadier drummers killed during the First World. Two further battles were fought to control the Chemin des Dames, neither involved the British but the casualties suffered by the French and Germans who contested the area ran into the hundreds of thousands. With thanks to the Stradbroke Archive for providing some of the pictures.